Acute pancreatitis can be a mild, transitory illness or a severe, rapidly fatal disease. About 80% of cases of the disease are acute interstitial oedematous pancreatitis which has a low morbidity and mortality rate (<1%) and roughly 20% of patients with acute pancreatitis develop necrosis of pancreatic and peripancreatic tissues. The course of severe acute pancreatitis may include an early vasoactive and toxic phase, and a late period dominated by septic complications. Improved intensive care treatment can reduce the early cardiorespiratory and renal complications related to systemic inflammatory response syndrome (SIRS).1 2 Pancreatic infection is reported to develop in 40–70% of patients with necrotising pancreatitis and is the main life threatening complication of the disease; furthermore, consecutive sepsis and sepsis related multiple organ failure are responsible for a mortality rate of up to 50%.3-5 In the early phase of acute pancreatitis, a broad range of specific treatment modalities have been evaluated, but all have proved ineffective.6-8 Therefore, interest has focussed on the prophylactic administration of antibiotics. The use of antibiotic treatment is based on the rationale that reduction of pancreatic infection will decrease late morbidity and mortality. However, the beneficial effects of antibiotic prophylaxis are still controversial. Animal studies have shown spontaneous bacterial infection of the pancreas.19 In healthy animals, immunocompetent cells usually clear these contaminating organisms. However, stress, such as acute inflammation, renders the pancreas vulnerable to bacterial infection; the intestinal mucosal barrier fails, allowing these organisms to translocate to mesenteric lymph nodes, the systemic circulation, the portal venous circulation, the peritoneal cavity, and abdominal organs, with resulting supervening sepsis and critical complications. As most pathogens in pancreatic infection are gastrointestinal Gram negative bacteria, the colon seems to be the main source of pancreatitis related infections. It is, therefore, possible that bacterial translocation is the most important mechanism for contamination of pancreatic necrosis. However, considerable controversy exists about the exact pathway: do bacteria enter the pancreas after colonic translocation, through the lymphatics and circulation via contaminated ascites, or do they migrate directly to the inflamed gland because of the proximity of the transverse colon to the pancreas? In summary, the most probable source of pancreatic infection seems to be the colon via bacterial translocation. However, the exact route of post bacterial transmural migration is still unknown. Possible pathways are via the lymphatics and consecutive haematogenous spread, or transmurally to the pancreas. The Atlanta symposium classification25 of severe acute pancreatitis links it to organ failure and/or local complications, including necrosis, abscess, or pseudocysts. Usually, pancreatic infection is linked to the development of pancreatic necrosis, which is defined as either a diffuse or focal area of non-viable pancreatic parenchyma, and is typically associated with peripancreatic fatty tissue necrosis. A pancreatic abscess is a consequence of severe acute pancreatitis and is a circumscribed intra-abdominal collection of pus, usually in the proximity of the pancreas and containing little or no pancreatic necrosis. It is likely that pancreatic abscesses are a consequence of limited necrosis, with subsequent liquification and secondary infection during the course of severe acute pancreatitis. A postacute pseudocyst is pancreatic juice, enclosed by a wall of fibrous or granulated tissue, which may develop in severe acute pancreatitis; bacteria may be present. The influence of bacterial infection on morbidity and mortality in severe acute pancreatitis has been analysed in surgically treated patients with infected pancreatic necrosis and in patients with sterile necrosis who have had surgery.5 This study looked at 170 patients with severe acute pancreatitis. Of these, 42% had infected pancreatic necrosis and 58% had sterile necrosis. Preoperative morbidity in the group with infected pancreatic necrosis was significantly higher than in patients with sterile necrosis with respect to pulmonary (56% v 72%), renal (28% v 45%), and cardiocirculatory (13%v 30%) insufficiency. The mortality rate in the infected group was 20% (14 of 71 patients), a figure significantly higher than in the sterile group (11%; 10 of 99 patients). In summary, infected pancreatic necrosis is a significant prognostic factor in severe acute pancreatitis. As infection is the leading cause of morbidity and mortality from acute pancreatitis, diagnosis and optimal treatment of infectious complications is vital. While most complicating infections in animal pancreatic studies, hospitalised patients, and in pancreatic infection are caused by a few species of bacteria (table 2), normal intestinal flora consists of more than 400 species.34 In the natural course of severe acute pancreatitis, cultures of infected pancreatic necroses yield monomicrobial flora in 60–87% of cases; in these studies, polymicrobial flora was confirmed in only 13–40% of cases (table2).5 26 27 A preponderance of Gram negative aerobic bacteria is usually present (Escherichia coli, Pseudomonas spp,Proteus, Klebsiellaspp) which suggests an enteric origin, but Gram positive bacteria (Staphylococcus aureus,Streptococcus faecalis,Enterococcus), anaerobes, and, occasionally, fungi have also been found.5 26 27 35-39 The incidence of fungi in long term disease may increase, especially after prolonged antibiotic treatment.5 27 In one study, candida infection was reported in 21% of patients with infected pancreatic necrosis.40 Luiten et alstudied prospectively the difference between Gram negative and Gram positive infection in patients with infected pancreatic necrosis.41 They found that Gram negative infection was linked to a significantly higher mortality than Gram positive pancreatic infection. Given the poor prognosis of patients with severe acute pancreatitis and infection, the possibility of prevention and/or treatment of pancreatic infection has received major attention. A summary of the options follows. Infection of initially sterile pancreatic necrosis develops in the later stages of severe acute pancreatitis, thus effective antibiotic treatment may reduce late mortality. Three early studies of the use of prophylactic intravenous antibiotics in the treatment of unselected patients with acute pancreatitis failed to show any favourable effect on morbidity and mortality.42-44 However, most of the patients in these studies had mild acute pancreatitis with no risk of pancreatic infection. Furthermore, later studies that focussed on pancreatic tissue concentrations of antibiotics after intravenous administration showed that ampicillin, the drug used most frequently in these early trials, failed to reach therapeutic concentrations in the infected gland, or to cover the Gram negative micro-organisms present in infected pancreatic necrosis.45 46 This altered pharmacokinetic behaviour of antibiotics is based on the observation that the pancreas has a barrier comparable to the blood–brain barrier47; this blood–pancreas barrier is responsible for the selective uptake of antibiotic drugs into the pancreas. Evaluation of the concentrations of the various classes of antibiotics has shown that the quinolones (ciprofloxacin, ofloxacin) and the carbapenem, imipenem, are substances with high pancreatic tissue concentrations and the highest bactericidal activity against most of the organisms present in pancreatic infection.45 In contrast, aminoglycosides are unable to penetrate human pancreatic tissue in bactericidal concentrations. The efficacy factors of some antibiotic classes are listed in table 3. This factor includes the type and frequency of bacteria found in infected pancreatic necrosis, antibiotic tissue concentrations, and the percentage of inhibited bacterial strains according to the minimal inhibitory concentration (MIC). Consequently, an ideal efficacy factor of 1 corresponds to complete inhibition of bacteria in infected pancreatic necrosis. Imipenem has an excellent efficacy factor of 0.98, whereas aminoglycosides have a very low factor (0.13). Metronidazole acts exclusively against anaerobes and is recommended only in combination with non-anaerobic antibiotics. Sainio et al observed a significantly reduced mortality rate in patients with severe acute alcohol induced pancreatitis treated with cefuroxime. The reduction in mortality from 23% in the control group to 3% in the treatment group was not associated with reduced pancreatic sepsis, and probably reflected a significantly decreased frequency of infectious complications.49 However, the number of patients was low (30 v 30), cefuroxime was changed to alternative antibiotics after a mean of 9.2 days in 20 of the 30 patients in the antibiotic group, and antibiotics were started in 23 of 30 patients in the control group at a mean of 6.1 days. Although the pancreatic pharmacokinetics of cefuroxime are unknown, failure to reduce pancreatic sepsis suggests poor pancreatic penetration similarly to other second generation cephalosporins. This is in contrast to third generation cephalosporins, which achieve adequate pancreatic tissue concentrations. The combination of ceftazidime, amikacine, and metronidazole for 10 days decreased the incidence of sepsis in patients with severe alcoholic acute pancreatitis, but no statistical differences were found for pancreatic infection and mortality.50 However, conclusions from this study should be interpreted with caution because of the low number of patients recruited (n=23). Additionally, amikacine belongs to the aminoglycosides class, which do not seem to penetrate the pancreas adequately. In a clinical controlled study using intravenous antibiotic prophylaxis with ofloxacin and metronidazole, Schwarz et al noted that the rate of Gram negative pancreatic infection in the treatment group (1/13 patients, 7%) was lower than in the control group (6/16 patients, 46%).51 However, no statistically significant reduction in pancreatic infection was seen because of the low number of patients in the study. In summary, only the study of cefuroxime by Sainioet al showed significantly reduced patient mortality following prophylactic treatment with antibiotics.49 Unfortunately, all prospective studies analysing antibiotic prophylaxis in acute pancreatitis have used small sample sizes. Problems with data analysis have been compounded by the negligible incidence of mortality in the control population. Thus, Golub et al performed a meta-analysis of all prospective trials in order to see whether there is a therapeutic role for antibiotics in acute pancreatitis.54 The authors found that mortality was significantly reduced in a subgroup of patients with severe pancreatitis who were given broad spectrum antibiotics. Medical experience also supports the administration of prophylactic antibiotics as the incidence of pancreatic infection seems to have over the past 10 years. With the introduction of antibiotic prophylaxis, both Banks et al, and Ho and Frey, have reported a reduction in infected necrosis at a single institution from 67% to 32% and 76% to 27%, respectively.39 55However, patient survival has stabilised or has shown a non-significant trend to decrease. In conclusion, no sufficiently powerful randomised controlled trial proves definitively that there is a role for prophylactic antibiotic treatment.56 However, current evidence would seem to justify early prophylactic administration of an antibiotic concentrated by the pancreas (for example, imipenem) in patients with severe acute pancreatitis.57 Further trials are urgently needed to evaluate the duration of antibiotic treatment, the administration of antibiotics alone or in combination with antimycotics, and the apparent shift in bacteria during the past two years. In an uncontrolled clinical study, SDD reduced the infection rate and sepsis in patients with acute pancreatitis complicated by acute respiratory failure, but mortality did not change.65Luiten et al published a randomised controlled trial investigating SDD in patients with severe acute pancreatitis, defined by an Imrie score ⩾3 and or a Balthazar grade D or E.35 66 67 Fifty of 102 patients were treated with oral and rectal administration of colistin sulphate, amphotericin, and norfloxacin, combined with a short term systemic prophylaxis with cefotaxime until the cultures taken orally and rectally became sterile. In patients treated with SDD the overall incidence of infected necrosis (18% v 38% in the control group, p=0.03) and the rate of re-laparotomy (3.1 in the control groupv 0.9 in the SDD group, p<0.05) was significantly reduced. Potentially, these findings can be ascribed to the notable reduction in Gram negative infected pancreatic necrosis (33% in the control group v 8% in the SDD group; p=0.003). Overall mortality in patients treated with selective decontamination was not significantly reduced (22%v 35% in the control group). However, the authors suggested that SDD reduced mortality in patients with severe acute pancreatitis and an Imrie score ⩾3, regardless of the CT findings on admission. Nevertheless, the most important question remains unanswered: were the positive results in the treatment group achieved by topical treatment with SDD or by the short term application of intravenous antibiotics? Few data exist about the efficacy of continuous regional arterial perfusion (CRAI). Habashi et al studied intravenously or intra-arterially administrated antibiotics in bile induced acute pancreatitis in dogs. CRAI of antibiotics decreased the serum concentrations of endotoxin and phospholipase A2 activity, and completely prevented the occurrence of pancreatic infection; it also significantly improved the survival rate in the test animals.68 Unfortunately, the conclusions of this study are limited by the length of follow up (36 hours). In another study, Takeda et al examined the CRAI of nafamostat, a protease inhibitor, in combination with antibiotics.69 Fifty three patients were divided into three groups: group I (16 patients who were referred more than eight days after disease onset) received intravenous nafamostat and antibiotics; group II (22 patients referred within seven days) received nafamostat via CRAI, and antibiotics intravenously; group III (15 patients referred within seven days) received both nafamostat and imipenem via CRAI. The incidence of infection of pancreatic necrosis in group III (0%) was significantly lower than in groups I (50%) and II (22.8%). The mortality rates in groups II (13.6%) and III (6.7%) were significantly reduced, compared with that in group I (43.8%), but were not significantly different from each other. The major drawbacks of this study are its uncontrolled, non-randomised design, the use of different antibiotics, the short duration of antibiotic infusion, the clinically difficult technique, and the simultaneous use of a protease inhibitor, which may have complicated interpretation of the results. Therefore, further studies are necessary to evaluate the role of intra-arterial regional antibiotic treatment in severe acute pancreatitis. Local infection of necrotic areas of the pancreas influences the course of the disease, the prognosis, and the clinical management. Bacterial infection of pancreatic necrosis is usually suspected in patients who develop signs of sepsis, and is confirmed by a bacteriologically positive fine needle aspiration. Conservative treatment will lead to almost 100% mortality in patients with signs of local and systemic septic complications.36 70 71 Even after surgery, infected necrosis carries a mortality rate (ranging from 15 to 82%) which is three times higher than the mortality of sterile necrosis.72 73 Infected pancreatic necrosis is a clear indication for surgery, but the management of sterile pancreatic necrosis is controversial. Over the past two decades, most surgical centres have adopted a very aggressive surgical approach to severe acute pancreatitis. However, there is now a growing trend towards treating patients with sterile severe acute pancreatitis conservatively. Surgical intervention may be limited to patients with a deteriorating clinical course which does not respond to intensive care.36 74-76 However, it should be noted that valid criteria for surgical intervention in patients with sterile necrosis is still undetermined and under discussion. Nevertheless, there is general agreement that surgical treatment of severe acute pancreatitis should be postponed for as long as possible, and the second or third week seems to guarantee optimal operative conditions for necrosectomy. Surgical methods for the treatment of necrosis are varied and the best method has yet to be determined. The recommended, and currently accepted, surgical management technique should be an organ preserving approach which involves debridement or necrosectomy, combined with a postoperative management concept that maximises evacuation of retroperitoneal debris and exudate. Three comparable techniques are available: (a) closed continuous lavage of the retroperitoneum77 78; (b) management by planned, staged re-laparotomy79; and (c) the open packing technique.80 In experienced hands these approaches have reduced mortality from severe acute pancreatitis to <15%. Unproved strategies include percutaneous CT guided catheter drainage, recently described by Freeny and colleagues81; transoral intrapancreatic drainage and irrigation lavage reported by Baronet al,82 and laparoscopic necrosectomy.83 Further evaluation of these techniques is needed before they can be adopted into clinical practice. The authors wish to acknowledge Mark Kidd for his help in the preparation of this manuscript. (1997) Pathophysiological role of secretory type I and II phospholipase A2 in acute pancreatitis: an experimental study in rats. Gut 40:386–392. (1998) Infections complicating pancreatitis: diagnosing, treating, preventing. New Horizons 6:S72–S79. (1992) Early surgical debridement of symptomatic pancreatic necrosis is beneficial irrespective of infection. Am J Surg 163:105–109. (1985) Death due to acute pancreatitis. A retrospective analysis of 405 autopsy cases. Dig Dis Sci 30:1005–1018. (1986) Bacterial contamination of pancreatic necrosis. A prospective clinical study. Gastroenterology 91:433–438. 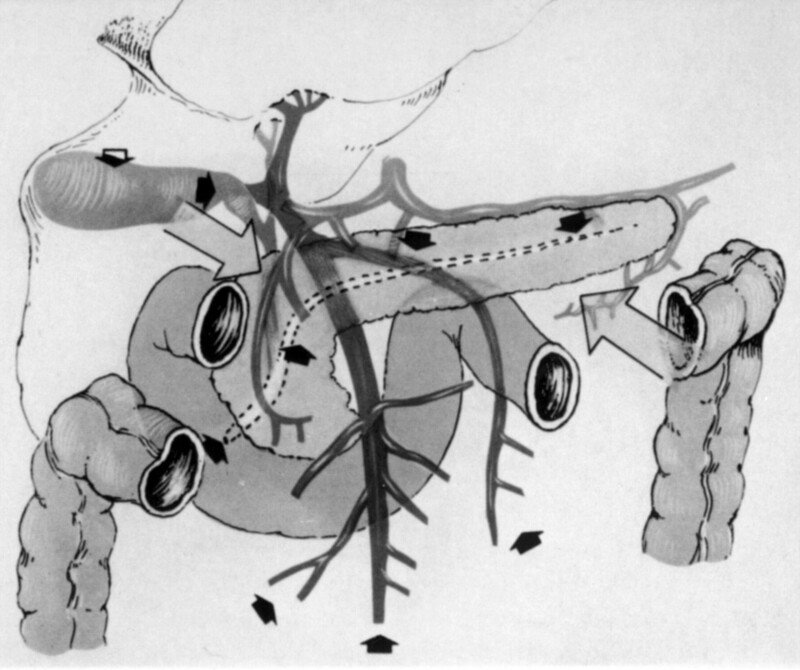 (1993) Gabexate mesilate in human acute pancreatitis. German Pancreatitis Study Group. Gastroenterology 104:1165–1170. (1996) Protease-antiprotease interactions and the rationale for therapeutic protease inhibitors. Scand J Gastroenterol 219 (suppl) 47–50. (1999) A randomised, double-blind, multicentre trial of octreotide in moderate to severe acute pancreatitis. Gut 45:97–104. (1987) The protective effect of a reduction in intestinal flora on mortality of acute haemorrhagic pancreatitis in the rat. Hepatogastroenterology 34:28–30. (1979) Postinduction bacteremia in experimental acute pancreatitis. Am J Surg 138:418–420. (1994) Routes of spread of pathogens into the pancreas in a feline model of acute pancreatitis. Gut 35:1306–1310. (1993) Bacterial translocation during acute pancreatitis in rats. Eur J Surg 159:109–113. (1996) Bacterial translocation in the course of acute pancreatitis: beneficial role of nonabsorbable antibiotics and lactitol enemas. Digestion 57:446–452. (1991) The role of the gut in the development of sepsis in acute pancreatitis. J Surg Res 51:18–23. (1995) Mechanisms of sepsis in acute pancreatitis in opossums. Am J Surg 169:227–232. (1998) Infected bile-induced acute pancreatitis in rabbits. The role of bacteria. Int J Pancreatol 24:111–116. (1964) Bacterial regurgitation in experimental pancreatitis. Am J Surg 107:18–23. (1994) The role of infection in acute pancreatitis. Dig Surg 11:214–219. (1990) Routes of spread of bacteria to the pancreas in acute necrotizing pancreatitis [abstract]. Pancreas 5:A736. (1993) Pathogenesis of pancreatic sepsis. Am J Surg 165:46–50. (1997) Cerulein-induced acute pancreatitis in rats: does bacterial translocation occur via a transperitoneal pathway? Pancreas 15:291–296. (1987) The gut origin septic states in blunt multiple trauma (ISS = 40) in the ICU. Ann Surg 206:427–448. (1998) Prognostic importance of Gram-negative intestinal colonization preceding pancreatic infection in severe acute pancreatitis. Results of a controlled clinical trial of selective decontamination. Intensive Care Med 24:438–445. (1993) A clinically based classification system for acute pancreatitis. Summary of the International Symposium on Acute Pancreatitis, Atlanta, Ga, September 11 through 13, 1992. Arch Surg 128:586–590. (1987) Early diagnosis of pancreatic infection by computed tomography-guided aspiration. Gastroenterology 93:1315–1320. (1989) Microbiological findings in severe acute pancreatitis. Surg Res Commun 5:1–4. (1991) Infected necrosis: morbidity and therapeutic consequences. Hepatogastroenterology 38:116–119. (1991) PMN-elastase in comparison with CRP, antiproteases, and LDH as indicators of necrosis in human acute pancreatitis. Pancreas 6:253–259. (1996) Human pancreas-specific protein. A diagnostic and prognostic marker in acute pancreatitis and pancreas transplantation. Int J Pancreatol 19:165–170. (1988) Necrosectomy and postoperative local lavage in necrotising pancreatitis. Br J Surg 75:207–212. (1993) Pancreatic necrosis: an early finding in severe acute pancreatitis. Pancreas 8:358–361. (1993) Pancreatic infection in experimental acute pancreatitis: a frequent finding [abstract]. Digestion 54:A119. (1996) Colonization and translocation of intestinal bacterial flora. Transplant Proc 28:2653–2656. (1995) Controlled clinical trial of selective decontamination for the treatment of severe acute pancreatitis. Ann Surg 222:57–65. (1993) Pancreatic infection complicating acute pancreatitis. Br J Surg 80:148–154. (1991) Operative management of acute pancreatitis: ventral open packing. Hepatogastroenterology 38:134–138. (1990) Retroperitoneal and peritoneal drainage and lavage in the treatment of severe necrotizing pancreatitis. Surg Gynecol Obstet 170:197–203. (1995) CT-guided aspiration of suspected pancreatic infection: bacteriology and clinical outcome. Int J Pancreatol 18:265–270. (1996) Surgical strategy and management of infected pancreatic necrosis. Br J Surg 83:930–933. (1997) Differential prognosis of Gram-negative versus Gram-positive infected and sterile pancreatic necrosis: results of a randomized trial in patients with severe acute pancreatitis treated with adjuvant selective decontamination. Clin Infect Dis 25:811–816. (1975) The use of ampicillin in acute pancreatitis [letter]. Ann Intern Med 83:831–832. (1975) Evaluation of prophylactic antibiotics in acute pancreatitis. J Surg Res 18:197–200. (1976) A prospective study to determine the efficacy of antibiotics in acute pancreatitis. Ann Surg 183:667–671. (1992) Human pancreatic tissue concentration of bactericidal antibiotics. Gastroenterology 103:1902–1908. (1994) Behavior of antibiotics during human necrotizing pancreatitis. Antimicrob Agents Chemother 38:830–836. (1986) Blood-pancreatic juice barrier to antibiotic excretion. Am J Surg 151:205–208. (1993) A randomized multicenter clinical trial of antibiotic prophylaxis of septic complications in acute necrotizing pancreatitis with imipenem. Surg Gynecol Obstet 176:480–483. (1995) Early antibiotic treatment in acute necrotising pancreatitis. Lancet 346:663–667. (1996) Prophylactic antibiotics in treatment of severe acute alcoholic pancreatitis. Pancreas 13:198–201. (1997) Antibiotic use in necrotizing pancreatitis. Results of a controlled study. Dtsch Med Wochenschr 122:356–361. (1998) Controlled clinical trial of pefloxacin versus imipenem in severe acute pancreatitis. Gastroenterology 115:1513–1517. (1995) Pathogenesis and prevention of early pancreatic infection in experimental acute necrotizing pancreatitis. Ann Surg 222:179–185. (1998) Role of antibiotics in acute pancreatitis: a meta-analysis. J Gastrointest Surg 2:496–503. (1997) The role of antibiotic prophylaxis in severe acute pancreatitis. Arch Surg 132:487–492. (1996) A critical review of antibiotic prophylaxis in severe acute pancreatitis. Am J Surg 172:38S–43S. (1998) Antibiotic prophylaxis in the initial management of severe acute pancreatitis. Br J Surg 85:582–587. (1984) The effect of selective decontamination of the digestive tract on colonisation and infection rate in multiple trauma patients. Intensive Care Med 10:185–192. (1990) Effects of selective decontamination on Gram-negative colonisation, infections and development of bacterial resistance in esophageal resection. Intensive Care Med 16:S224–S228. (1992) Selective gut decontamination reduces nosocomial infections and length of stay but not mortality or organ failure in surgical intensive care unit patients. Arch Surg 127:163–167. (1992) Prevention of nosocomial infection in critically ill patients by selective decontamination of the digestive tract. A randomized, double blind, placebo-controlled study. Intensive Care Med 18:398–404. (1992) A controlled trial in intensive care units of selective decontamination of the digestive tract with nonabsorbable antibiotics. The French Study Group on Selective Decontamination of the Digestive Tract. N Engl J Med 326:594–599. (1992) Role of bacterial infection in diet-induced acute pancreatitis in mice. Int J Pancreatol 11:49–57. (1995) Effect of different regimens of gut decontamination on bacterial translocation and mortality in experimental acute pancreatitis. Eur J Surg 161:85–92. (1992) Prevention of bacterial infection and sepsis in acute severe pancreatitis. Ann R Coll Surg Engl 74:329–334. (1984) Prognostic factors in acute pancreatitis. Gut 25:1340–1346. (1985) Acute pancreatitis: prognostic value of CT. Radiology 156:767–772. (1996) Therapeutic effects of continuous intraarterial antibiotic infusion in preventing pancreatic infection in experimental acute necrotizing pancreatitis. Pancreas 13:184–192. (1996) Continuous regional arterial infusion of protease inhibitor and antibiotics in acute necrotizing pancreatitis. Am J Surg 171:394–398. (1986) Decision-making in surgical treatment of acute pancreatitis: operative or conservative management of necrotizing pancreatitis? Theoretical Surg 1:61–68. (1989) Antibiotics in acute pancreatitis. Current status and future directions. Am J Surg 158:472–477. (1997) Natural course of acute pancreatitis. World J Surg 21:130–135. (1991) Surgical strategies in the treatment of pancreatic necrosis and infection. Br J Surg 78:133–137. (1994) Infection and acute pancreatitis. Br J Surg 81:1707–1708. (1991) A prospective longitudinal study of observation versus surgical intervention in the management of necrotizing pancreatitis. Am J Surg 161:19–24. (1993) Surgical strategies in acute pancreatitis. Hepatogastroenterology 40:563–568. (1993) Necrotizing pancreatitis: necrosectomy and closed continuos lavage of the lesser sac. The Ulm experience. in Standards in pancreatic surgery. eds Beger HG, Büchler M, Malfertheiner P (Springer Verlag, Berlin, Heidelberg). (1989) Debridement and closed cavity irrigation for the treatment of pancreatic necrosis. Br J Surg 76:465–471. (1991) Acute necrotizing pancreatitis: management by planned, staged pancreatic necrosectomy/debridement and delayed primary wound closure over drains. Br J Surg 78:576–581. (1993) A fifteen year experience with open drainage for infected pancreatic necrosis. Surg Gynecol Obstet 177:215–222. (1998) Percutaneous CT-guided catheter drainage of infected acute necrotizing pancreatitis: techniques and results. AJR Am J Roentgenol 170:969–975. (1996) Endoscopic therapy for organized pancreatic necrosis. Gastroenterology 111:755–764. (1998) Laparoscopic infracolic approach for complications of acute pancreatitis. Semin Laparosc Surg 5:189–194.